Copalis Beach appears to have another Razor Clam dig coming up, Long Beach is open, but nothing in the Twin Harbors area still. Crabbing is still open with catches still good but down a bit from last week. Rings or Pots are allowed. Use good bait. 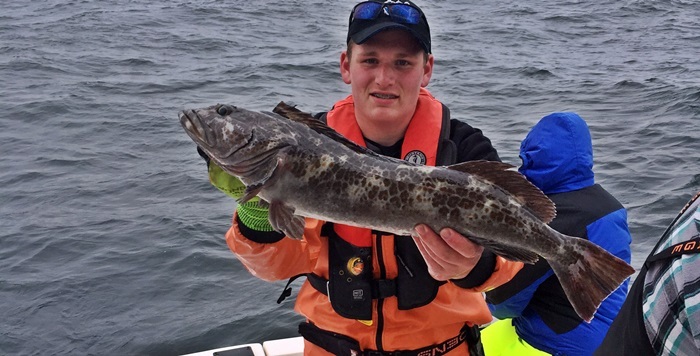 Ling cod opens a little less than 3 weeks from now and we are all hoping that the weather will cooperate as will the fish. The Salmon University seminar is coming up in April so make sure you reserve your spot soon. Have Fun, be Safe, and we will see you in Westport! Rory O’Connor and pooch limited on tasty Blackmouth this weekend. 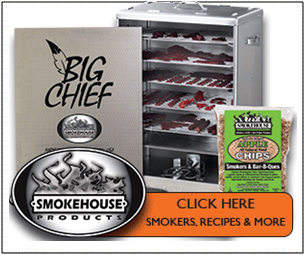 I lick my chops just like that when I think about BBQ’d Winter Chinook. I like the PFD on the dog. 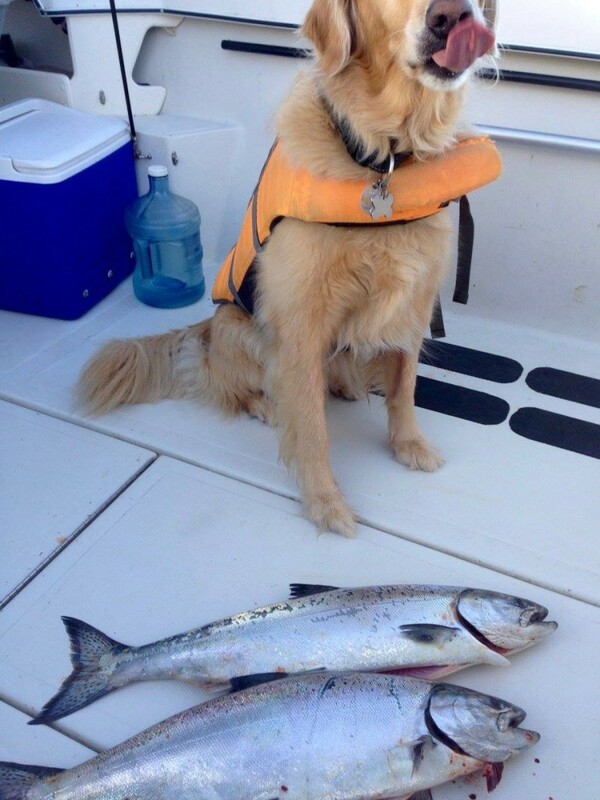 A life jacket is also man’s best friend on the water. 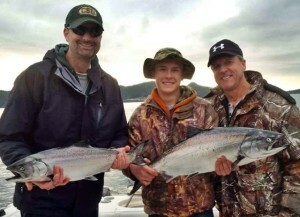 Salmon fishing is fair to slow in the San Juan Islands. It’s worth getting out there and giving it a try though. You never know when you could land on some nice fish. Silver Horde Kingfisher lite spoons, and Lurecharge Hootchies, behind an 11” flasher have been working for us. Forty-eight inches of leader on the spoons and 36-inches on the hootchies should get you dialed in. Any color as long as it’s greenish or purpleish. Two Bald Eagles duke it out over a fish near Friday Harbor. You never know when you might have a cool sighting like this anywhere in the Islands. That’s pretty close between 2nd and 3rd, although maybe not as close as that Daytona 500 finish, sheesh! And, this tournament isn’t over by a long shot. It’s scheduled to last through April 10th. 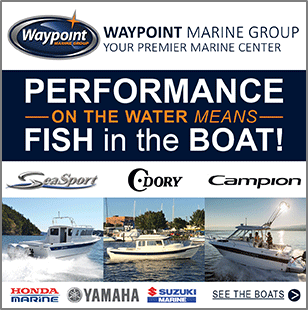 Thanks to King’s Marine in Friday Harbor for sponsoring the ten week long tournament. All proceeds go to San Juan Island Emergency Medical Services. Bob Rondeau, the Voice of the Huskies, had a good day fishing with Derek Floyd of Angler’s Choice Charters. This beautiful Blackmouth fell to a Silver Horde cookies and cream spoon. Look at that weather and water. What an awesome time to be out February fishing in the ‘Juans. Submitted by Kevin Klein, Fidalgo-SanJuan Islands Chapter PSA, CCA Northsound. The cover image of this week’s fishing reports was also contributed by Klein. The cover image of this week’s fishing reports was also contributed by Kevin. It shows Greg Gorder and the 15.46lb Chinook he caught to take the week 3 prize and move into 2nd place in the Frank Wilson Memorial Blackmouth Derby. Gorder also won the local derby hosted by the Bluewater Bar and Grill in Friday Harbor held on Saturday February 22nd. Not a lot of boats out fishing in Area 8-1. The foul weather had much to do with the number of anglers. A few blackmouth were caught in the Camano Island area who for the most part were fishing the bottom 10 feet of water with Silver Horde Coho Killers. Fishing was fair in Area 8-2 with about one fish caught per two fishermen. Most of the blackmouth were caught by anglers who fished the reef that runs from Gedney Island to Camano Head. The Olympic Peninsula Salmon Derby was held this week-end in Area 9 and 6. Friday’s weather was horrible as was Sundays, so few fish were caught on those two days. On Saturday the weather calmed and fishing was good. Danny Davis from Anacortes won the 1st Place Prize of $10,000 with a 20 lb 7 oz fin clipped blackmouth caught in Area 6. Ronald Gustafson from Port Angeles took 2nd with a 15.35 and Quinn Boudle from Blaine captured 3rd Place with a 13.80 Blackmouth. Most of the larger salmon were caught in Area 6. Area 6 is now closed to fishing! 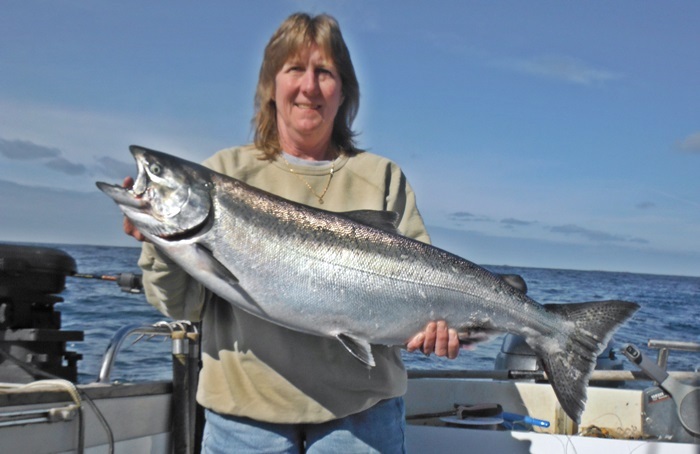 The salmon fishing continues to be slow with very little fishing pressure the usual areas to fish are Quarter Master Harbor, Slag and Clay Bank areas the typical depths to fish are in 120′ to 150′ of water and within 10′ of bottom there has been some bait right on the bottom. Flasher and spoons usually seem to work best this time of year. For latest information call (253)591-5325. Crabbing is now closed in Area 11. 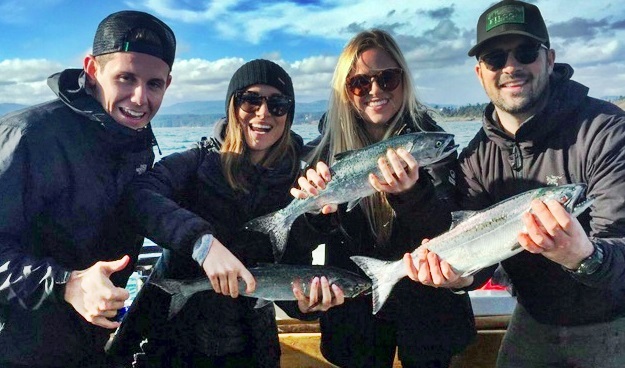 Basic Fishing Classes (Adults 15+) Cost $10 March 5, 2016 10 am to 12 noon at Point Defiance Marina. Pre-register at MetroParksTacoma.org/GO or call 253-591-5325 Learn beginning fundamentals for fresh and salt water angling including regulations, equipment, tackle, rigging, knots, casting, fish identification, landing and care for fish. Basic Fishing Classes (Youth 8+) Parent or guardian welcome to register and learn with their youth. Cost $10 April 2, 2016 10 am to 12 noon at Point Defiance Marina. Pre-register at MetroParksTacoma.org/GO or call 253-591-5325 Learn beginning fundamentals for fresh and salt water angling including regulations, equipment, tackle, rigging, knots, casting, fish identification, landing and care for fish. Pier Peer in Tacoma –See and touch creatures brought up from local divers. Participate in plankton and sea life netting to view the variety we have in Puget Sound as you learn about these amazing creatures from Tacoma Nature Center and Point Defiance Marina educators. Saturday, March 5, 2016 from 7:30-9 pm Cost $8 For ages 8+. Every youth needs an adult chaperone. Complementary Hot Chocolate and Coffee. Sign up online at MetroParksTacoma.org/pier-peer or 253-591-5325. • Tables can be rented to sellers at $5 per table. Must reserve in advance at PDM Boathouse. The Washington Department of Fish and Wildlife (WDFW) predicts “Good” prospects for Coho during February in Marine Area 12. The Washington Department of Fish and Wildlife (WDFW) predicts “Good” prospects for Coho during February in Marine Area 13. The sun is shining brightly after several days of light rain showers. It is chilly in the morning with temperatures in the mid 20s hitting the mid 40s after sunup. The last few days the wind has been light or non existent. I have recently added a weather station to my toys. What I am seeing is just what I have felt. On a falling barometer the fish turn off and on a rising barometer the fish are more aggressive. The wife and I this past Saturday, and again Monday, fished Canal Lake. The barometer was rising and inside of 90 minutes we had caught our limit of 10 rainbow. Then Monday, fishing the same location and time of day with the barometer in about the same time, caught but 2 bows of the smaller variety. The boat ramps have very few fishermen and it looks like they are clustering fishing for perch. I see them off of Perch Point over by Medicare Beach and on the east side of a rock cropping about mid point of the dam. I will be fishing Walleye this Wednesday and hope to get a personal report next week. 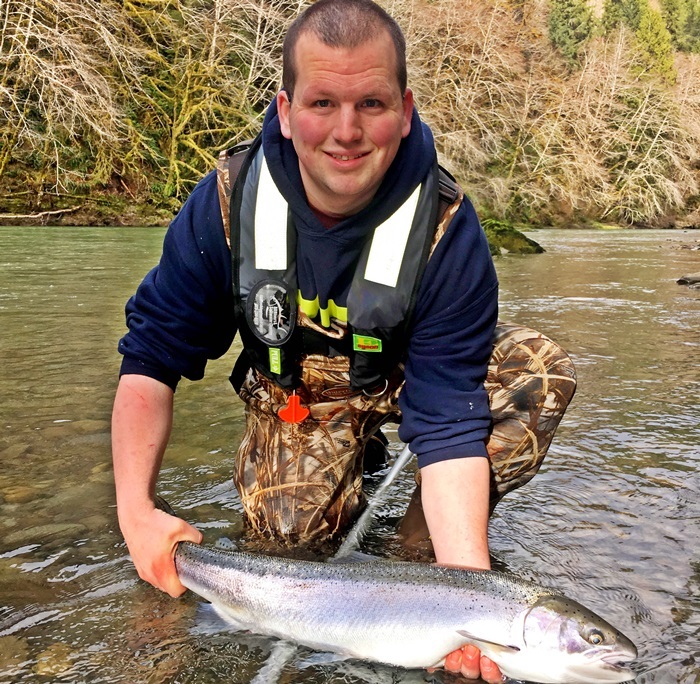 We finally got a break from the record setting rainfall and, as expected the wild steelhead, have made a solid showing in most coastal rivers. My advice is to fish high in the systems when the rivers are up then move down as they drop. 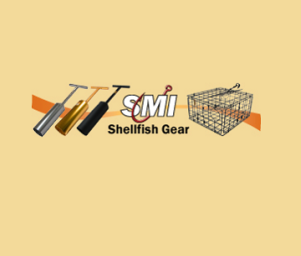 Fishing cured eggs or sand shrimp is our top choice in areas that are open for bait or drift yarnies or artificial worms in selective gear rules areas. We have mixed availability over the next month for these trophy wild steelhead trips. Good luck. Report submitted by Mark Coleman, All River and Saltwater Charters; 425-736-8920. Nothing much has changed over the last couple weeks, aside from a couple slow days, we have continued to enjoy a very consistent winter chinook fishery. There has been fish in Howe Sound and Vancouver Harbour. Now that we are getting into late February, the days are getting longer and the frequency of warmer, almost spring like days is increasing. 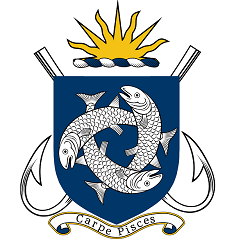 We have been on the water almost daily during the month of February and overall we have been impressed with our local fishery. One thing that has stood out this winter, is the higher then normal numbers of sub legal chinook in Howe Sound. With some luck these 18 to 24 inch chinook salmon will continue to feed and grow and contribute to an active spring fishery off the South End of Bowen Island in April and May. We have been spending the majority of our time in Howe Sound and have been finding some nice legal fish on most of our trips. We have had some fish weighing into the teens and have had reports of fish in the 20 pound plus range. We did spend a couple days in Vancouver Harbour last week and did find legal and sub legal fish along the West Vancouver shoreline. Dave and crew with a couple of nice winter fish. We have been having quite a bit of our success on Gibbs Delta Skinny G’s. The Outfitter and Bon Chovy patterns have been particularly effective for us. We have been running them on a 4 to 6 foot leader. Smaller G Force and Silver Horde Spoons have also worked well as usual. The key in the winter is finding a few lures that work for you and cycle through them depending on the day and how things are going. Our charter shop on Granville Island has a solid selection of fishing tackle for local Vancouver waters. Stop by if you are looking for some advice and the right gear for the winter salmon fishery. Crabbing in Vancouver Harbour has been tougher than normal in Vancouver Harbour over the last couple weeks. Prawning has been productive in Howe Sound. From now until March 31st we are running our annual Winter Chinook Charter Special. Right now our Canadian dollar is at a 15 year low and the savings for our clients from the United States is crazy. With the exchange rate being so lopsided, we have some amazing rates for day charters and overnight packages complete with waterfront accommodations. We have full day trips for 4 people on for $565.00 US per boat. A package with 2 full days fishing and one night accommodation at a seaside cabin is $399.00 US per person based on 4 people on a boat! Please call or email for more details! Great rates for a winter fishing trip. A beautiful 12 pound winter Chinook. Weather has been the biggest factor in our fishing effort the past couple of weeks. It’s whether or not we can get out and fish! The Harbor mouth, and other close by areas can always be fished, and usually are productive but high winds and big seas have kept us away from the offshore fishing. Salmon fishing has been steady with a few nice fish up to 20 pounds. Fishing with smaller spoons and needle fish hootchies behind a flasher is the most productive method. Fishing deep, right on the sandy bottom areas is best. Halibut fishing has been slow, but only because the weather has limited the amount of effort. When the winds and seas lay down fishing is good. I like to fish with a variety of baits. Herring, octopus, salmon, squid are all good. Fishing a grub tail off a spreader bar will quite often out fish the baits and when action is slow a mudraker jig thumping on the bottom will sometime entice a bite. Salmon fishing was GOOD for anglers in East Sooke. Anglers were catching springs as large as the mid teens in the bay. It has been best between the Cheanuh Marina breakwater and Fraser Island. This was the best place to fish in south Island waters for good sized fish this past week. Anglers have been successful with all types of gear. Anchovies in glow teaser heads have been very effective. Spoons, such as the G-Force and Skinny G, in Cop Car, Bon Chovy or Irish Cream colours were also effective. For flashers, the Madi, Lemon Lime and Purple Onion have been good. Some halibut up to 50 lbs were also brought back to the marina. Salmon fishing was GOOD this past week. The Flats have been holding some nice fish recently for those trolling close to the bottom. It’s been best in 100-140 depths. Good lures have been Green Splatterback Coho Killers, Skinny G spoons and APT Needlefish spoons. Halibut fishing was GOOD over the weekend. On Thursday, Steve, and brother Johnny, Webb caught halibut weighing 20 and 50 lbs off Oak Bay, one on herring and the other on herring with a glow hoochie. Anglers that were fishing were using extra large herring, salmon bellies and/or octopus for bait. Berkley Gulp and Powerbait soft plastics also work very well. You can also use Mudraker, Lucky or other large Jigs if you want to stay away from the dogfish. Salmon fishing was GOOD, just like last week. There were lots of springs up to 10 lbs at the entrance to the bay. The trolling pattern has been doing figure eights between the Deep Hole and the Can Buoy. The anglers are fishing close to the bottom and often bouncing the downrigger balls on the bottom, in 120-150 feet of water. There is still a lot of bait right inside the bay. Small spoons, such as the G-Force, Coyote and Gypsy, in the glow and/or any bright colours were very effective. Hootchies and squirts also produced well. Flashers that remain popular include Glow green, Lemon-Lime and Purple Onion. And you can’t go wrong fishing anchovies in a Bloody Nose teaser. Halibut fishing was GOOD over the weekend. Ben Wright caught a 55 lb halibut on a pink and white hootchie with a herring off of Race Rocks. Best areas were Race Rocks, William Head and Constance Bank. Anglers that were fishing were using extra large herring, salmon bellies and/or octopus for bait. Berkley Gulp and Powerbait soft plastics also work very well. You can also use Mudraker, Lucky or other large Jigs if you want to stay away from the dogfish. Salmon fishing was FAIR near Sidney. The Red Can and Arbutus Point produced legal size springs.. The majority of the winter springs caught recently have been short of the minimum size for retention and most areas have some fish. Most anglers are fishing using anchovies in Bloody Nose and UV Green teaser heads. Coho Killer spoons have also been working well, especially in double glow and Gold Nugget. The salmon fishing was GOOD for winter springs this past week. 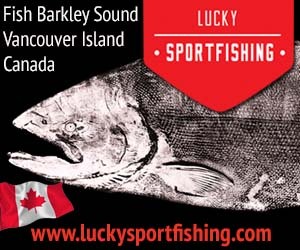 There are lots of small 2-5 lb springs off Sooke right now but not too many larger fish. It’s been good around the 140 foot contour. The 3”-4” Coyote, Gypsy and G-Force spoons, as well as hoochies, are the top choices for Sooke anglers. G-Force spoons in Outfitters, Irish Cream and No Bananas have been very popular. Hoochies in White Glow, Army Truck and Tiger Prawn have been catching their fair number of fish. The most popular flashers recently have been the Purple Onion, the Gibbs Outfitter and the Lemon Lime. Being in the Olympic rain shadow means more sun and less precipitation around Victoria and though we have had some rain we have also had some great sunny weather. Border and Constance banks have seen of our time and the majority of the action at depths from 90′- 140′ with lines fishing tight to the floor. Most of the Chinook bites are coming while moving with tide. Action has intensified around both morning and afternoon slacks with springs ranging from 2-8lbs. The most consistent producers were coho killers and 2.5 kingfisher spoons in shades of green, while purple haze and white glow needlefish hoochies worked through the morning tides. Green glow and the staple purple onion were the go to flasher colours. 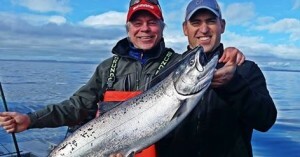 Right now you can expect anywhere from 4-10 Chinook per fishing trip. We haven’t done any halibut fishing the past week but others have and catching 1-2 halibut per trip. We expect things will pick up as the halibut fishing has pleasantly surprised many of us with consistent catches coming for most boats. Large herring, salmon bellies and mudraker jigs seem to do the trick. Submitted by Sam Vandervalk of Salmon Eye Charters (1-877-777-4344). Salmon Eye is recommended by USA Today, Cruise America and New York Times bestselling author Peter Greenberg in his book The Ultimate Insider’s Guide to the Greatest Experiences Around the World. Fishing for salmon was GOOD off Victoria. The fish were plentiful near Albert Head (on the pinnacles) and near Esquimalt, but still not very large. Constance Bank has been good and Brotchie Ledge to Ross Bay has also produced some fish. Spoons and squirts were successful in getting hook ups. Bloody Nose and Purple Haze have been the most popular colors for teaser heads. Good choices in plastic baits are the Electric Chair, Purple Haze and White Glow. Coho Killers, AP Needlefish, G Force and Coyote spoons in Green Splatterback, Moon Glow and Cop Car colours have also been good. The Purple Onion, Lemon Lime and Madi. Halibut fishing was GOOD over the weekend. There were quite a few halibut taken at Constance Bank and near Albert Head. Anglers that were fishing were using extra large herring, salmon bellies and/or octopus for bait. Berkley Gulp and Powerbait soft plastics also work very well. You can also use Mudraker, Lucky or other large Jigs if you want to stay away from the dogfish. The River blew out last week but has been dropping recently. The water level at the lake today was just over 2.1 meters and near Duncan at 1.75 meters. Although, it’s dirty and brown, anglers have been catching both steelhead and brown trout in the Riverbottom area, mostly from drift boats. For steelhead, good lures to fish are Spin ‘n Glo’s, Beads and yarn, Gooey Bobs and the always reliable Pink Worm. Spoons can also be a great lure in these conditions. Fly fishing for brown trout at the top end of the river has been good. Bass fishing is VERY SLOW. Fishing drop shot style is your best bet now. Soft plastics rigged “Carolina Style “are also a good choice when fishing the bottom, drop offs and reefs, and have been most productive in 4” Smoke or Pumpkinseed Yum baits. Langford Lake, Shawnigan Lake, Prospect Lake and Elk and Beaver Lakes are the best local bass lakes. St. Mary’s Lake on Salt Spring Island is also a great lake for bass fishing.